Citation Information: J Clin Invest. 2018;128(7):2833-2847. https://doi.org/10.1172/JCI98436. Classical monocytes recruited to the lung after IRI mediate neutrophil extravasation. WT mice underwent IRI using hilar clamping, and the myeloid cell populations were analyzed by flow cytometry. (A) Representative flow cytometry plots (left) and quantification (right) of extravasated neutrophils and recruited classical monocytes (CM) in resting state or that of hilar clamp–mediated IRI are demonstrated. 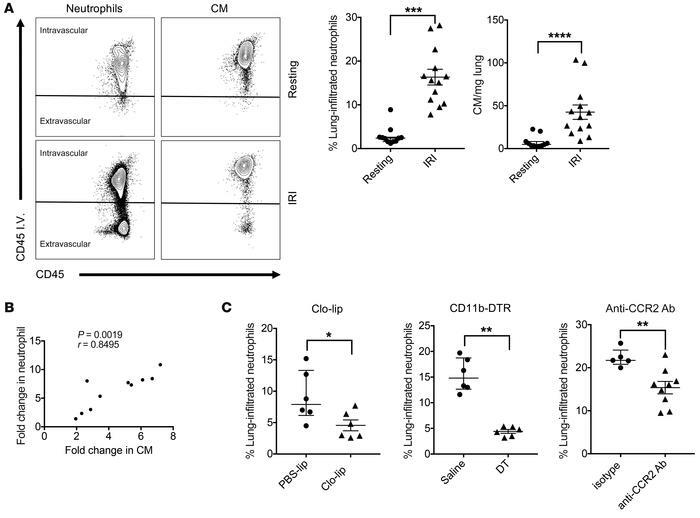 Neutrophils and classical monocytes were gated on live CD45+Ly6G+CD11b+SSChi and live CD45+Ly6G–NK1.1–SiglecF–CD11b+CD64–Ly6Chi cells, respectively. (B) Correlation between recruitment of classical monocytes following reperfusion of human lung allografts and increase in neutrophils in the BALF. The ratio of classical monocytes normalized by alveolar macrophages was correlated with an increase in bronchoalveolar neutrophils before and 15 minutes following reperfusion. Pearson’s correlation coefficient (r) was significant. (C) The percentage of extravasated neutrophils was determined after hilar clamp–mediated IRI in mice that were systemically depleted of monocytes 24 hours prior to IRI using Clo-lip (left), DT (CD11b-DTR mouse; middle), or anti-CCR2 antibody treatment (right). Data are expressed as median with interquartile range. n = 5–13 per group. *P < 0.05; **P < 0.01; ***P < 0.001; ****P < 0.0001, Mann-Whitney U test (A and C).